I read the article "The Trouble With Boys" in this week's Newsweek with a personal and a professional interest. My 8 year old son fits the description of the fidgety, active, hard to teach, behind in reading, boys in the article. Every night is a battle with home work, leaving my son in tears and hyperventilating, and my wife or myself totally frustrated. On a professional level, I receive calls and email almost every day from someone in the Chicago area asking for help in finding a tutor or mentor for a child, or a client. Too often I have to tell them that there are no programs in their zip code, or no programs serving the age group of their child. I can hear the disappointment and frustration of these people who are searching for extra help for their kids. It frustrates me not to know more about helping my own son, or to not be able to do more to make comprehensive, mentor-rich programs more available to people who need them. Michael Gurian was one of the researchers quoted in the Newsweek article. I looked up the Gurian Institute in a Google search and I've added a link to this site in the Research Sub Section of the LINKS library at http://msg.uc.iupui.edu/TMC/html/index.php Representatives of the Gurian Institute do workshops around the country, and you can find their schedule on the Gurian Institute web site. The Newsweek article also mentioned mentoring. The article talked about a New York City school called the Eagle Academy and said, "In the Eagle Academy almost every boy has a mentor" and "The impact of the mentoring program, has been beyond profound." While the focus of the Newsweek article is not on mentoring, making effective mentoring programs available in more places is the focus of the Tutor/Mentor Connection. This is the reason I keep inviting people who read my blog or visit T/MC web sites to be part of May and November Tutor/Mentor Leadership Conferences and /or the on-line forums hosted on the T/MC portal. Our goal is not just to help mentoring/tutoring programs share ideas among each other, but to create a growing public visibility that leads to a larger discussion of where mentoring is most needed and what support systems are needed to make effective volunteer-based mentoring available to more kids for longer periods of time (years not months). 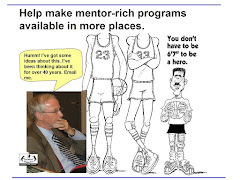 Imagine a day in the future when as many people were listening to people talk about ways to make quality mentoring programs available for more kids, as there are watching the American Idol TV show each week. If you can dare to dream this vision, you can also work to make it a reality. 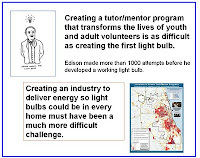 If you can find a role in the Tutor/Mentor conferences and discussions you can help draw greater public attention to infrastructure needed to assure that good volunteer-based tutoring and mentoring is available in more of the places where such programs are needed. I find that very few people focus on what it takes to have tutor/mentor programs available to more of the kids who need them. Thus, there are too few programs in most cities, and too few good programs in most cities. If we cannot change that, then there will be too many parents without the extra help the need to help their boys, and girls, reach their fullest potential in school, and in life. Tuesday's Chicago Tribune front page headline was "Suburban murders escalating". A map was included, that showed high murder rates in suburbs surrounding Chicago (Waukegan, Elgin, Aurora, Joliet, Cicero, Calumet City, Chicago Heights). The article talked about how poor people and street gangs are moving from the city because of the high costs of housing and how this growth in crime is a big problem for suburban police forces. In the lower right corner of the paper was a 2" section saying "Martin Luther King remembered". Unfortunately, there was not connection between these two stories. There was nothing on the editorial pages to encourage people to get involved in making Dr. King's vision a reality so that the high crime rates caused by concentrated poverty could be reduced. While we'd like the media who reach several hundred thousand readers each day to provide constant focus on this issue, it seems that it's up to us who connect via the Internet to make this happen. In the Discussion forum of http://msg.uc.iupui.edu/TMC/html/index.php the discussions focus on the various skills that every tutor/mentor program must master to be successful in long-term efforts to connect youth and adults with the result that by age 25 youth are starting jobs. In the Links, there are links to web sites that provide ideas for such discussions. For instance, in the Philanthropy section is a link to a site that focuses on a discussion of general operating grants vs project funding from foundations. This is a critically important issue for tutor/mentor programs because of our need for flexibility in responding to the needs of kids, and our need for continuity in what we do. Imagine a parent giving birth to a child and three years later saying, "you go find a new parent now". That's what happens when a foundation helps a youth program get started and connect with a kid, then after one, two or a few years says, "I cannot fund you any longer." If these kids live in a high poverty neighborhood this means that he/she is more likely to recycle in a life of poverty than be reborn in the land of milk and honey with a job and a career and an ability to raise a family. If the media don't connect the negative news and the positive news and actions people can take to end poverty, we need to find ways to do it on the internet media. We need to find ways to keep this conversation going every day, not just one day every year. Today is the annual holiday to celebrate the life and legacy of Dr. Martin Luther King, Jr.
All across America today is a day of speech-making and service. It’s a day when public leaders show their support for the vision and memory of Dr. Martin Luther King, Jr. Thousand of people will spend time in acts of community service. These speeches will follow a formula of talking about accomplishments of Dr. King, problems we still face, and hope for the future. They will end with a challenge to do more. The acts of service will be done in a day, with everyone back to their normal jobs tomorrow. I wonder what impact all this has on poverty or racism in America or the world? I wonder how many will use maps, like those at http://www.tutormentorprogramlocator.net/mapgallery.html to show where poverty is most concentrated in our cities, and to show where community based organizations are struggling to find resources to keep the hope alive and to meet the challenges? I wonder how many will focus on blueprints, like those used to build tall buildings, to show all of the people and organizations who need to be available in the life of a child as he moves through each stage of schooling and into a future job and career? 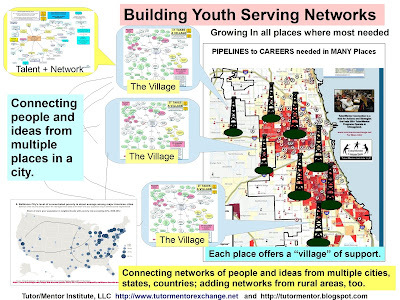 How many cities use Program Locators like the one the T/MC is hosting in Chicgo to connect volunteers and donors with charities in every neighborhood of a big city? “I’m also passing along a thought for our friends to think about: After Thomas Edison invited the light bulb, he had to invent an industry to put light bulbs in every home. Imagine what it might have been like trying to think of every thing needed to make that happen, and not having much of a blueprint to follow. As people make speeches today, I wonder how many are thinking like Edison, of all of the actions needed to end poverty and racism in America, or the world. 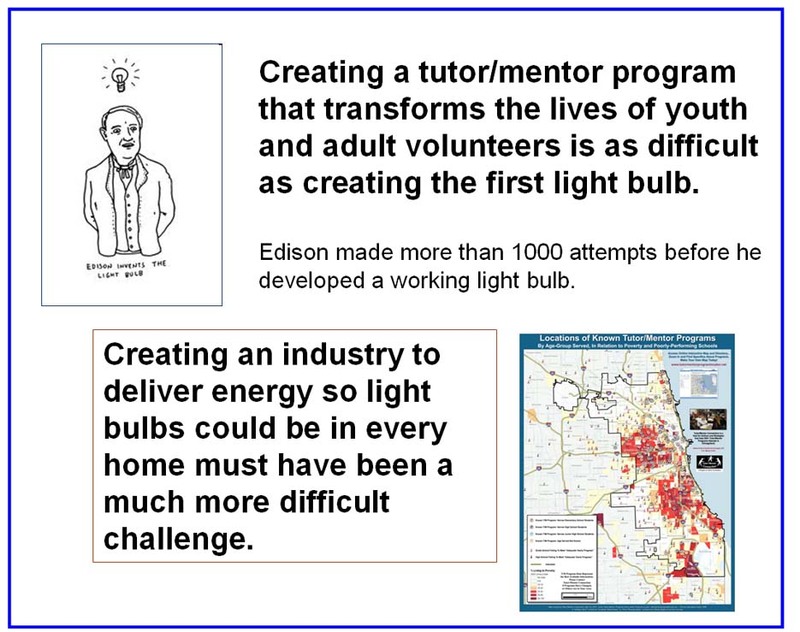 For volunteer-based tutoring/mentoring to be part of the lives of more youth living in high poverty neighborhoods, and to stay engaged until each youth is starting a job/career, we need to be just as creative, and persistent as leaders like Edison and Dr King. We need to build an industry that can provide the ideas, dollars, advertising, tech support and leadership needed by CBOs in every neighborhood in every big city. We need to make these resources continuously available for many years at Cabrini Connections, and thousands of similar programs in Chicago, in Detroit, New York and Los Angeles, and in every major cities around the world. It’s a huge, but critically important challenge. As you watch National Mentoring Month TV ads, or after you have attended dinners and community service events that honor heroes like Dr. King, I encourage you to think along with me about ways to make his vision a reality. To me, the real legacy of people like Dr. King and Cesar Chavez, Abraham Lincoln and Jesus, is their example of sacrifice, perseverance, service, learning and innovation. They were not involved in random acts of kindness. They understood that to make a difference you must be willing to sacrifice. You must have the courage and commitment to persevere, even when you are walking alone. They understood that the big problems will take a long time to solve, and that there must be people willing to sacrifice their lives (literally and figuratively) if they were to make a quantum change in the condition of their fellow man. Imagine what needs to happen to make comprehensive, volunteer-based tutor/mentor programs like Cabrini Connections available in every poverty neighborhood, not just in a few neighborhoods. What are the ‘tipping points”, or actions of a few that would have a benefit to hundreds of organizations doing similar work? Who are the people that you know who could become involved with the T/MC and this thinking and innovation process? The Internet and new information technology tools, like mind mapping and concept mapping, make it possible for people to put their dreams on web sites, and to create visual maps that illustrate who needs to be involved, and how long they need to stay involved. The T/MC seeks partners who will incorporate these concepts into the essays shown in the Tutor/Mentor Institute , which illustrates the ideas and strategies of the Tutor/Mentor Connection. I encourage you to share your ideas, and your vision, with a comment on this Blog, or in the Discussion Forum on the T/MC web site. Maybe next year, because of how we connect, and how we learn from each other, and from others, more of the leaders and service events will incorporate these concepts of continuous service, distribution of resources, and process improvement. It's a new year. Anything is possible.